This time, I wised up a little with the letter project. This time, it was a much quicker project, and one that I thought Colin got a much greater sense of satisfaction from. The fact alone that he didn't sit thumbing through the magazine for forever was big, but he actually did ALL of the finding, cutting, and gluing himself, with just a little "pre-help" from Mommy! It was funny to listen to him, too....you could hear him say, "buh, buh, bed....yep!" or "buh, buh, flower....nope." He really is starting to get the hang of phonics, which is exciting. bacon--this one he found and cut out, but somehow it never made it to the page! Must have ended up in the garbage pile, I guess; but I'm giving him credit for it anyway! Colin actually found the box and the blueberry on the backs of pages that I had given him--and I never even noticed that they were on there. 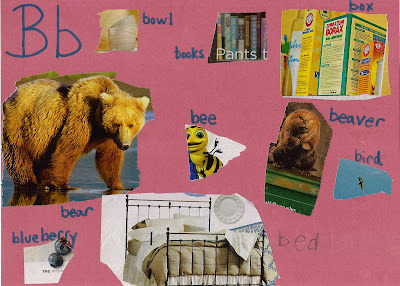 On the front of the pages--what I had seen and torn out for him to use--were the bed and the bear. But Colin turned the pages over and found the other things. He sounded them out, put it together that they started with "B", cut them out, and glued them on all by himself. Imagine how I felt when I saw that! It really is the coolest thing watching something you are trying so hard to get through to them actually click!